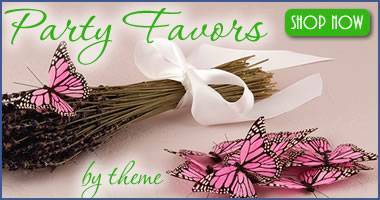 Welcome to Party Favor Source: Where to Go Online for Personalized Gifts & Party Favors! We offer the widest variety of on-trend personalized gifts and party favors for all events, budgets and themes, delivered on time and in tune with your unique style. 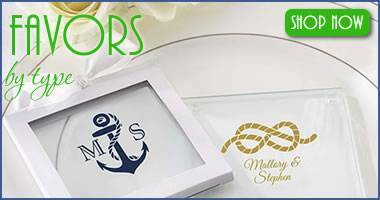 Our favors are organized by event, price, theme and type (such as bridesmaids gifts and groomsmen gifts) so you may easily choose from thousands of luxurious, affordable and inexpensive party favors! Our party favors and personalized gifts website offers a wide selection of favors for all life's celebrations including weddings, anniversaries, baby showers, bachelor and bachelorette parties, milestone birthdays, bridal showers, graduations, holidays, and religious events … all in one place for all budgets and design needs. We offer generous volume discounts at varying quantity levels. Combined with our reasonable shipping rates (including international shipping to over 200 countries) and superior customer service, we make shopping for party favors and personalized gifts easier than ever. Make sure to check out our Best Sellers section to find the most popular products on the website, all on one page. Ranging from personalized barware to engraved serving trays to personalized favor boxes to monogrammed gifts, our best sellers page has personalized gifts and party favors for almost any occasion. Our New Arrivals section displays the most recent items that have been added to our website. 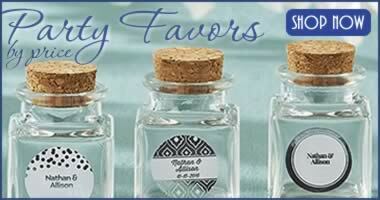 We always strive to bring you the newest on-trend personalized gifts and party favors. 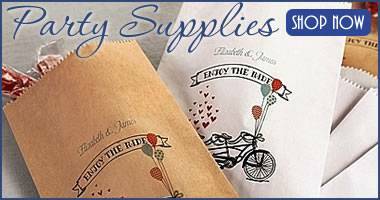 In fact, we add new products practically every day, so check this page often to discover our newest items … like our new line of Vineyard & Wine-Themed Favors, Gifts and Accessories. Please feel free to browse our site for our wide selection of thousands of party favors and gifts, and if you have any questions don't hesitate to contact us. We pride ourselves on our timely customer service … in fact, we'll even answer your e-mails on nights and weekends! The results from 2018 are in, and personalized stemless wine glasses were our top seller for the second year in a row. Next on the list of 2018's hot sellers, we saw vintage-inspired Bohemian and Shabby Chic themed items selling well. Looking forward to the remainder of 2019: palm leaf, flamingo and welcoming pineapple design favors and gifts are trending. You'll find a wide selection in our Pineapple & Tropical Chic favors section. We also expect cactus motif items in our Desert Chic section to really take off in the coming months. 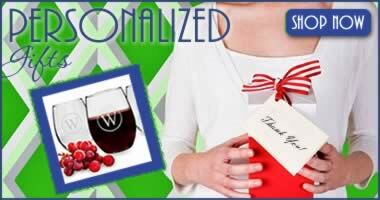 And our recently-added selection of Personalized Gift Sets is sure to please your bridesmaids and groomsmen, a family member receiving a keepsake gift for the holidays, a valued employee being recognized for their contributions, or perhaps a best friend celebrating a milestone birthday.